Most people think about identity theft as an issue that only happens when a criminal accesses personal information, and then takes over the checking account or opens up a new account under a new name. The reality of this is that identity theft often occurs when a thief gains access to info from paper records or the telephone. It is through these methods that criminals can access your name, Social Security number or address, and then open up a new account or take over an existing one. What can they get from my mail? These documents have enough information for one of the bad guys to take over an existing account or even open up a new account with your name and information. Though some data is omitted from these statements intentionally, there is often still enough information that they can fill in the missing pieces. When you think about the act of dumpster diving, it is likely that you picture a person who is in search of a meal or another item that can be recycled or reused. However, the homeless and hungry are not the only people who dive into dumpsters; criminals do too, as they know that the trash can contain treasures. Consider the mail you receive each day. What do you do with those bank statements and credit card offers? Do you put them through the shredder? Throw them in the garbage? Do you know what your bank does with forms from cashed checks or transfers? Are they safely disposed of? Remember, the information an ID thief can get from your mailbox is also available in dumpsters behind the bank, utility company, your doctor’s office and elsewhere. Recently, a colleague just three minutes in the dumpster behind a bank to see what he could locate. In those three minutes, he found records with account numbers, names, Social Security numbers, check photocopies with account numbers and more. In three short minutes, he had enough information on these customers to access their accounts and steal their identities. This, of course, was only for research, and he shredded what he found, but it is frightening to think about what is available to a thief who knows where to look. Stop getting paper statements. Electronic statements to email are safer and eco-friendly. Get a locking mailbox. The carrier does not require a key because there is a slot to place the mail. 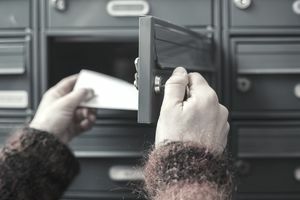 Consider a post office box for sensitive mail, such as bank statements. If you do not get mail for a couple of days, report it to the post office as someone may be stealing it. Pay attention to the dates of delivery on bills and statements. This way, you know if they were delivered on time or taken and returned by a thief. Request the removal of your information by the lists kept by the Direct Marketing Association. Eliminate all other unnecessary solicitation to minimize your risk. Choose to opt out of any pre-approved credit card offers. Is your full name on it? Is your address on it? Is your Social Security number on it? Is your birthday on it? Does it contain an account number? Does it have a password listed? Is it a financial statement? Does it have any of the above information on a family member of mine? If you can answer ‘yes’ to any of the above questions, you should make sure to shred it with a shredder with a crosscut before throwing it out. Crumpling up the paper or cutting a card in half does not protect the information from thieves. Keep a crosscut shredder where you keep your mail to ensure extra convenience and helps to make this a habit. Immediately start shredding anything that contains personal information that you want to get rid of. You should also remember that even though you might be cautious, responsibly shredding items that contain personal information at home, not everyone is. Your mortgage broker, bank or accountant may not be. This is where you may want to consider identity theft protection. You really cannot be too neurotic about shredding the sensitive documents you may have. After all, some people really make a career out of doing the ‘dumpster dive,’ and digging through the trash in search of items such as credit card pre-approvals, bank account info, mortgage statements, and medical bills. They use this information to commit fraud and create new accounts in the victim’s name. Also, keep in mind that anything that has your signature on it is a perfect find for any dumpster diver, as it can easily be forged. Surprisingly, dumpster diving is legal if it is in a public spot. This may include the large bins at apartment complexes. Those who dumpster dive are not always homeless people seeking out discarded food. Instead, they might see themselves as professional identity thieves. If they are smart, however, they will dress up like a homeless person to fool observers into thinking they are only looking for scraps of food. Your trash is a treasure to an identity thief. Consider all of the information that is on any paperwork you throw out – day after day and week after week – information such as the names of your children to your favorite store. They are simple puzzle pieces to an identity thief. Even an empty envelope with a return address on it can tell an identity thief information about you. Purchase a shredder. There are several different types on the market, and they come in varying strengths. Do not buy one that simply cuts the paper into strips. These can easily be reconstructed. A “micro-cut” shredder is a better option. Know that there are crooks out there who will take the time to put shredded documents back together again. After shredding the documents, if you’d like extra security, place the pieces into a cardboard box that is continuously filled. When this box is filled, make sure to burn them. Keep in mind that a thick stack of documents will not burn well, so make sure that you spread the paper out as much as possible. Think about this for a second: if someone took your trash, would you have an issue with that? If you say yes, then you are throwing out too many items with personal information. Since I do not throw out anything that would be of value to anyone, such as items with my personal information, I don’t care if they do. Shredding Primary Documents: Everything that comes in the mail with my name on it goes in the shred pile unless I need it. I shred and destroy CD’s with data, prescription bottles, old tax documents, bank statements, investments statements, paystubs and canceled checks. Shredding Secondary Documents: These are documents such as ATM receipts, utility bills, credit card statements or insurance policies. Keep in mind that you should keep them for two years unless you can access them online. If you don’t need them, shred them. Devices: Do not forget to destroy or shred devices, too. This includes SD cards, hard drives, SIM cards, mobile phones and thumb drives. When reinstalling or reformatting your operating system, it will get rid of most of the information, but there are always ways to get it. So, consider taking a sledgehammer to your old computers if you don’t want the information out there. Reduce Your Paper: One way to reduce all of the stuff that requires shredding is to stop using so much paper. At this point, almost any account, including utilities, banks, mobile phones and credit cards, have e-statements available. With these, each month you will get an email alerting you to a new statement that you can view or download. Just remember, don’t click any links in the email. It’s best to enter it manually. Join a Shred-a-Thon: Many banks offer a shred-a-thon, where one of those very large and in charge shredding trucks show up in the bank’s parking lot. Bring all of your boxes of documents and watch them get safely shredded before your eyes. Burn It: Depending on things such as local ordinance and the amount of stuff you have, you may want to burn your documents when its time to burn leaves or when you are having your next bonfire.